Skin cells known as keratinocytes have been found to possess the same olfactory receptors that occur in the nose. The receptors in the nose have long been known to be responsible for detecting scents or odors after binding to specific aromatic molecules. Now these receptors have been found not only in the skin but also in the prostate, kidneys and the intestines. A major difference in receptor location involves sensitivity. The receptors in the nose are far more sensitive, and interactions here with low concentrations of the appropriate molecules usually produce the typical sensory perception of odors or fragrances. Sandalwood (Santalum album) essential oil, used in aromatherapy, contains molecules that bind to the olfactory receptor OR2AT4 in the skin. With OR2AT4, this binding triggers a calcium-dependent signaling pathway that results in an increased proliferation and a more rapid migration of skin cells. This response is characteristic of skin healing. When the same receptor in the nose is activated by sandalwood oil molecules, a message is sent to the brain that mediates the sense of smell. In the skin, activation of OR2AT4 stimulates wound healing. (1) It appears that receptor location in the body dictates not only sensitivity but also function of the receptor. The scientists who made this discovery have also found other, unrelated olfactory receptors in the skin and plan future research to characterize their function. 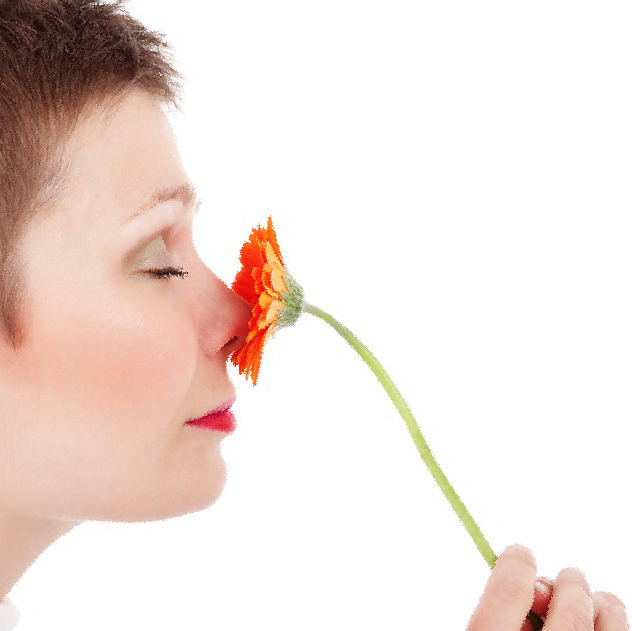 Additionally, olfactory receptors in other organs possess a totally unknown function. A full mechanistic characterization of these olfactory receptors may lead to the development of new drugs and, in the case of skin-based receptors, unusual and healthful cosmetics. More importantly, future research may lead to a more complete understanding of this specific receptor-molecule binding as it relates to the complex interactions between humans and their environment. 1D. Busse et al., “A synthetic sandalwood odorant induces wound healing process in human keratinocytes via the olfactory receptor OR2AT4. Journal of Investigative Dermatology, 2014; doi: 10. 1038/JID.2014.273.